"Congratulations, You're going to live forever… Regrettably, it's probably not going to be a very good time~"
An Un-Ideal Eternity is about a man named Desmond, who is killed, revived, and then finds himself immortal in a post-apocalyptic society. Just because it’s a society doesn’t mean that either he or “they” have to be civilized. And just because a gentleman has become immortal does not mean that he has no dangers to be wary of. The good news is that he’s been afforded some very kind and very generous ministrations from his future-self. The bad news is that all those efforts might still not be enough, to allow our hero, to live in as untroubled and as un-tumultuous a manner as he’d prefer. 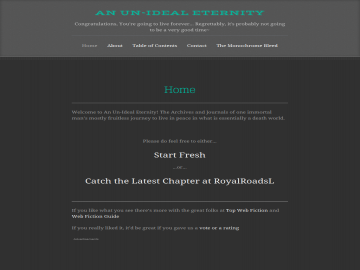 An Un-Ideal Eternity has not been reviewed yet. An Un-Ideal Eternity has not been recommended yet.